1. How to activate Sync2 Cloud? 2. For how long my license will be active? 3. What to do if I want to move Sync2 Cloud to another computer? 4. How refund policy works? 5. Why do I need to upgrade? 7. If I bought Pro Edition of Sync2 Cloud do I need to reinstall it? 8. Can I synchronize iPhone Calendar and Contacts with Outlook? 9. What is the difference between Sync2 and Sync2 Cloud? 10. Does the synchronization happen automatically? 11. Can I choose specific folders that I want to synchronize? 12. Can I synchronize Facebook or other online calendars or address books with Outlook? 13. What is the difference between Free and Pro versions? 14. Can I choose the synchronization direction? 15. What are the limitations of a Free version? 16. Does Sync2 Cloud synchronize tasks? 17. Can I synchronize more than one account? 18. How can I synchronize multiple accounts? 19. Can I synchronize Outlook with my phone? 20. If I want to sync Outlook with my phone do I need to connect my phone to the computer? 21. Do I need to use iTunes in order to sync Outlook with iPhone? 22. Will the changes made in Outlook Calendar or Contacts will be transferred to iCloud and Google Calendar or Contacts? Open Sync2 Cloud and in the top menu choose “Activate”. Enter your Activation Code in the Activation Code field from Online Activation dialog. Learn more about activation here. Your license will be active for as long as you want, but you cannot have the same license on multiple computers. If you want to install Sync2 Cloud on another computer first you have to de-activate your license and then activate it on another computer. You have to de-activate your license and then activate Sync2 Cloud license on another computer. Learn more about license agreement here. Sync2 Cloud has 14 days No Questions Asked refund policy, so you can get a refund during 14 days’ time period without any reason. If you have any questions contacts us. With software upgrades we are fixing the problems. If any problems occur after Microsoft upgrades Outlook with our software upgrade, we fix all the issues. Also, after you get an upgrade you will get free support for 1 year. With the upgrades we fix possible security issues. We guarantee that during one year after upgrade the sources will work and in case of problems we will fix it for free. You can purchase Sync2 Cloud with a credit card, PayPal or via bank transfer. The purchase process is completely secure, because we are storing only your contact information, but not the credit card or PayPal information. Your purchase is secured by Norton. You don’t need to reinstall the software; you only need to enter the Activation Code which you will receive in your e-mail. If you didn’t receive the email, contact us. Yes, Sync2 Cloud lets you synchronize iCloud Calendar and Contacts with Outlook. Yes, with Sync2 Cloud Pro version you can set the synchronization once and it will sync all the data automatically at selected time intervals. Yes, you can to go to “Filters” tab and select specific folders you want to synchronize. At this moment it is not possible, but this feature will be added in the future, as well as other popular sources. Using you can manually synchronize your data once in a month. With Pro version you can synchronize your data automatically, you have unlimited number of manual synchronization, also you can synchronize multiple accounts. Sync Cloud versions comparisons. Yes, you can choose one-way to two-way synchronization, as well as synchronization direction. With Free version you do not have automatic synchronization, you can manually sync your service with Microsoft Outlook only once in a month and you can only synchronize one account. Yes, with Sync2 Cloud you can choose synchronization between tasks (but not the to-do lists and reminders on iPhone). 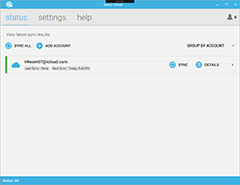 Yes, with Sync2 Cloud Pro version you can synchronize multiple accounts of the same type e.g. you can sync three different Gmail accounts and two different iCloud accounts with the same Outlook account. In order to sync multiple accounts, go to “Add source/account” tab and choose another account. Select what you want to synchronize, choose synchronization direction and click “Finish”. Yes, you can sync your iPhone or Android phone with Microsoft Outlook. In order to sync Outlook with your phone you do not need to connect your phone to a computer, you can sync your data over the native cloud services such as Google or iCloud. No, you don’t have to connect your phone to the computer, because Sync2 Cloud can sync your phone with Outlook wirelessly. No, with Sync2 Cloud you do not need to use iTunes to sync Outlook with iPhone. Keep in mind that in order not to get duplicates and have better Outlook performance you should turn off the iCloud Calendar, Contacts and Tasks synchronization using iTunes. To do that you need to go to iCloud settings and iTunes settings and turn off the synchronization. Changes made in Outlook will be automatically transferred to Google or iCloud, you just need to enable Google or iCloud synchronization on your devices.